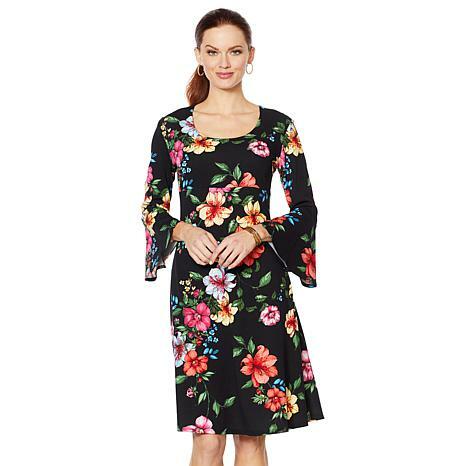 I purchased two of these dresses, I LOVE the textured fabric, it hides lumps/bumps. Also it is NOT HOT, it is just textured in appearance. I read the measurements and ordered my "normal" 1X, read the measurements to ensure that you get the right fit. The color of the black is vibrant and office appropriate, at 5'7 the dress is below the knee but not too long. It has stretch. I have purchased almost all the textured dresses from Slinky in the last two years, they don't fade. Continue making! Love this dress, great fit great style. You aced this one Jackie!! Love the colors. I love this dress! I normally don't do alot of floral, but the Green looked vintage and I thought I'd try.What a great fit! Love the floral print, and the Small (145lbs) fit perfectly. I am tall(5'10) and the length was perfect, just grazing my knee.I'm thinking of getting another one.Please make this style in solid, and sleeveless.